The TriHyBus is the product of a cooperation agreement between UJV Rez, Skoda Electric, Linde Gas, Veolia Transport, Proton Motor (Germany) and IFE Halden (Norway). Skoda Electric was responsible for the bus, including its electric drive system and system integration, and Proton Motor supplied the triple hybrid fuel cell propulsion system. The project was coordinated by UJV, a leading research institution in the Czech Republic. This environmentally friendly and highly efficient technology, unlike conventional hybrid propulsion systems, has no combustion engine whatsoever, and is instead a combination of fuel cells, batteries and ultracapacitors. The standard-sized, 12 meter-long, bus uses a 48 kw Proton Motor fuel cell along with a bank of ultracapacitors and batteries which are recharged during braking. The bus is filled with 20 kg of gaseous hydrogen at 350 bar and does more than 250 km per tank with a maximum speed of 65 km/h. 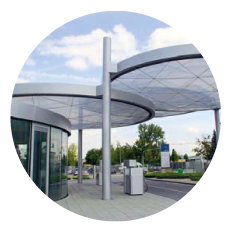 A hydrogen refueling station was built by the Linde Group in Neratovice and is supplied with compressed hydrogen gas from off site. The filling process of TriHyBus takes less than 10 minutes. There will be organised short commented drives during the coffee breaks. Use this unique chance to learn more about TriHyBus! Toyota has been pioneer in Hydrogen vehicle technology since 1992 (started to develop the technology of FC stack) and after the 20 years of development, the Mirai has become the first mass-produced hydrogen powered vehicle as a natural evolution of Prius PHV. Toyota has been also very proactive in initiative of building the H2 infrastructure. The Mirai provides similar driving experience as a conventional car with internal combustion engine. The hydrogen that powers the Mirai, can be produced from various types of primary sources, making it a promising alternative to current energy sources. The Toyota Fuel Cell System (TFCS) combines proprietary fuel cell technology that includes the Toyota FC Stack and high-pressure hydrogen tanks with the hybrid technology. The TFCS has high energy efficiency compared with conventional internal combustion engines, along with superior environmental performance highlighted by zero emissions of CO2 and other pollutants during vehicle operation. The hydrogen tanks can be refueled in approximately three minutes *1, and with an ample cruising range, the system promises convenience on par with gasoline engine vehicles. *1 Toyota measurement under SAEJ2601 standards (ambient temperature: 20 °C; hydrogen tank pressure when fueled: 10 MPa). 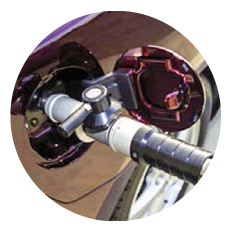 Fueling time varies with hydrogen fueling pressure and ambient temperature. The Mirai offers the kind of exceptional value drivers would expect from a next-generation car: distinctive exterior design, excellent acceleration performance and unmatched quietness thanks to motor propulsion at all speeds, in addition to enhanced driving pleasure due to a low center of gravity bringing greater handling stability. The fuel cell stack assembly comprises of the fuel cell stack, auxiliary components (hydrogen circulating pump, etc.) and fuel cell boost converter. Integrating these components achieves a smaller, lighter, and less expensive fuel cell stack assembly. Toyota demonstrated its first Fuel Cell Electric Vehicle (FCEV) in 1996. 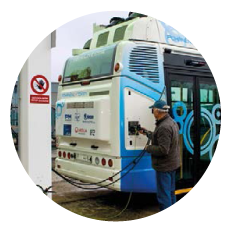 FCEV is a truly innovative mobility solution based on our Hybrid System –itself a result of long development and testing. Since then, we have made great progress: a vehicle ready for mainstream use. With annual sales of 3 000 fuel-cell vehicles currently, Toyota plans to increase the figure 10-fold by 2020. In Europe, there were 23 units sold in 2015 and 62 units sold in 2016. However Mirai is not about numbers right now. At this stage, the main role of Mirai is for Toyota to break the chicken-and-egg cycle to enable energy providers and governments to be confident that they can start infrastructure development and deployment. Since Toyota launched Mirai, it’s fair to say that the conversation about Hydrogen has increased dramatically, and we see a huge interest from many regions in Europe and worldwide. In January 2015, Toyota invited royalty-free use of approximately 5 680 fuel cell related patents held globally, including critical technologies developed for Toyota Mirai. The list included approximately 1 970 patents related to fuel cell stacks, 290 associated with high-pressure hydrogen tanks, 3 350 related to fuel cell system software control and 70 patents related to hydrogen production and supply. It was for the first time that Toyota made its patents available free of charge, providing the support for developing a hydrogen-based society. Patents related to fuel cell vehicles will be available for royalty-free licenses until the end of 2020. Patents for hydrogen production and supply will remain open for an unlimited duration. In January 2017, “Hydrogen Council” launched in Davos. Thirteen leading energy, transport and industry companies have launched a global initiative to voice a united vision and long-term ambition for hydrogen to foster the energy transition. During the launch, members of the ‘Hydrogen Council’ confirmed their ambition to accelerate their significant investment in the development and commercialization of the hydrogen and fuel cell sectors. These investments currently amount to an estimated total value of €1.4 Bn/year. The ‘Hydrogen Council’ is currently made up of 13 CEOs and Chairpersons from various industries and energy companies committed to help achieve the ambitious goal of reaching the 2 degrees Celsius target as agreed in the 2015 Paris Agreement. The international companies currently involved are: Air Liquide, Alstom, Anglo American, BMW GROUP, Daimler, ENGIE, Honda, Hyundai, Kawasaki, Royal Dutch Shell, The Linde Group, Total and Toyota. The Council is led by two Co-Chairs from different geographies and sectors, currently represented by Air Liquide and Toyota.